Where in the design process would a transdisciplinary designer (individual) meaningfully collaborate with others (collective)? Report: My focus was on the role of Ethnography as a design methodology; and how it can be adopted to explore potentiality in transdisciplinary design collaboration. 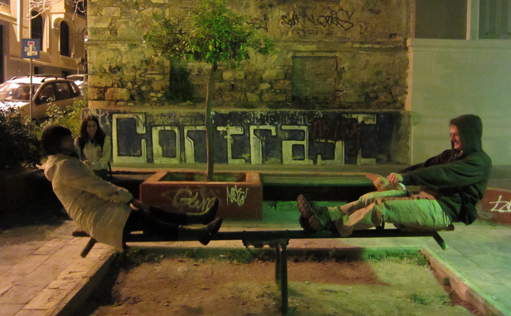 During Spring Break, classmate Bland and I had the opportunity to go to Athens, Greece to take part in a collaborative project called Against All Odds. This one week intensive workshop with 7 New School students and 8 Greek participants from various nationalities and disciplines became the subject of my research. Through this case study, I analyzed and reflected upon the research process (observation > insight > ideas > solution), and used ethnographic research to understand and observe cross-cultural transdisciplinary collaboration. 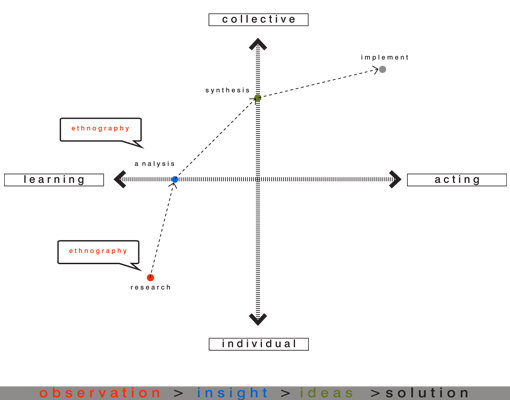 Diagram: The polarity map illustrates the process in which collaboration experiences various phases in the design process. First, during the research phase, individuals learn knowledge through observations and understanding. During the analysis phase, insights are revealed during the process of collaboration through a participatory exercise. Synthesis occurs when collective ideas are then generated and encouraged to be exchanged in a fluid environment, Finally, implementation takes place through designing a solution collectively based on knowledge gathered in previous stages of the design process. However, for my research, I only touch upon the process (research and analysis) where I thought Ethnography would most appropriately be used. Findings: The method of ethnographic research was adopted as a means to observe human behavior and understand the ways individuals from different disciplines collaborate. The ways in which each researcher “observed” the environment and self – documented their findings came in different forms/ techniques / medium. Some sketched, others used recorders to capture the environment, some relied on their tilt-shift camera techniques, and others captured scent. The various ways in which each researcher documented their findings revealed their personality and how they perceived the urban environment. Conclusion: Through the AAO case study, my report examined the appropriate use of ethnographic research as a method that allows for a deep understanding of a specific demographic. To research and analyze a specific environment and the people who construct a community, Ethnographic research is most likely the best method in achieving a strong understanding of relational dynamics of people, places, and objects. However, its limitations lie in generating data on a broad spectrum of people. Its qualitative research method contextualizes a particular group and not to a broader audience. Perhaps there is an important balance in performing both qualitative research methods that touches upon rich, humanistic approaches that are speculative (cultural probes, ethnography, personas, etc.) as well as including quantitative data that might be more justifiable through concrete evidence. In retrospect, a week long charrette that calls for “ethnography” would probably be challenged as real ethnographic work by Sociologists and Anthropologist who are required to conduct fieldwork for years. However, perhaps there is something very liberating and transformative about this flash Ethnographic research and the field of design. The findings that were gathered were insightful and the method allowed for different qualitative variables to arise to the surface. Thus, these unique insights that emerged during the process would not have been possible if it had not been for a Transdisciplinary collaboration. The interesting shifts are in the fluid mix of different minds coming together. The idea of Transdisciplinary almost becomes a hybrid discipline where process is not linear but dynamically balanced.